In Hawaii, late spring going into summer is MANGO SEASON! In my opinion this is the absolute best time of the year. My neighborhood is filled with mango trees and I count the days until the delicious fruits are ready. Finally, after months of staring at the unripe mangos, the time has come. Mango season is here! Since I wanted to save the freshness of these perfect mangos long after mango season has passed, I decided to make them into jam. My favorite way to preserve fruit. 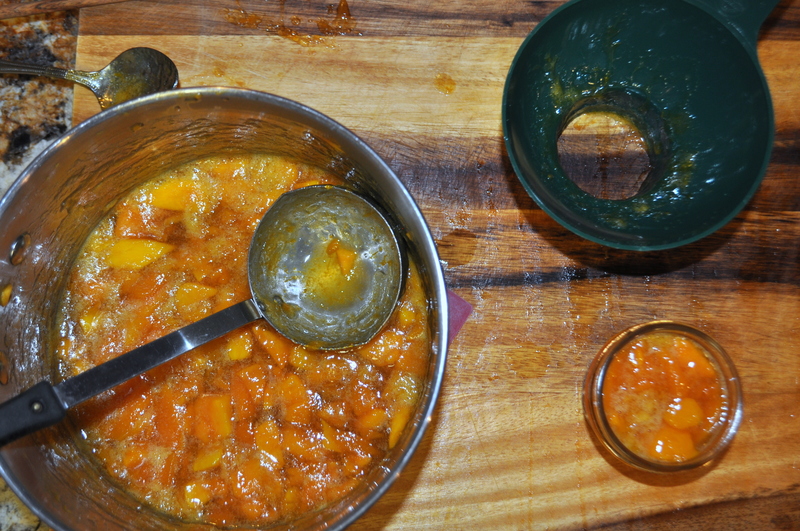 This jam is super easy to make and depends completely on the quality of your mangos. They need to be so ripe they are almost spoiled to taste at their peak in the jar months down the road. You can use mangos from the grocery store if you don’t live in a place where you can get pity mangos though. Just make sure that you choose ones that smell ripe at the store and taste, taste, taste to make sure you have the right amount of sugar and lemon to enhance the mangos’ flavor. I promise fresh mango jam is worth it! I use mango chutney a lot in my curry, but I’ve never tried mango jam. As it goes, mango doesn’t grow so weill in England. YUM! We lived in the Caribbean the past two years, and the whole island was covered in goats. They went absolutely BANANAS during mango season! There would be a whole herd of them pigging out in the middle of the road, completely ignoring your car horn. I can’t blame them though, mangos are delicious. I love this jam! You’re able to enjoy them year round this way! haha, mango politics 🙂 I wish we had more fruit politics on the news. I am not as big a fan of the chock mangos. I prefer the Haden ones. Luckily, there are big trees of both on my street so I don’t have to chose! What do you prefer in place of mangos? Though, come to think of it, I have never seen it written. Might be “chalk”. Now I will have to investigate. Either way, they are good for cooking but not for snacking straight off the tree. HA! I think I may have spelled that incorrectly, ‘CHOKE’ as in plenty, BAHAHAHAHA!!! We just got given a 5 gallon bucket of mangos. I can’t wait to try this! Molly have you ever made mango chutney out of green mangoes ? In Australia, it is something we make every Christmas, in early December. I haven’t. I would love to though! Do you have a favorite recipe? Hi, I do, it’s my Gran’s recipe (which was her mother’s). I will find it for you. 500g preserved ginger – cut by hand. Do not put in food processor. 500g dates – cut by hand. Do not put in food processor. Peel and cut mangoes into 1 cm pieces. Place in china bowl and cover with cooking salt. Mix through. Cover with tea towel and leave overnight to draw the water out. Next day place all ingredients into a large pot and bring to boil. Simmer for 1.5 hours stirring occasionally. Cool completely before bottling. This makes an enormous batch so reduce quantities for smaller batches. We eat in in Australia on cold cuts – chicken, turkey, ham, roasts etc. Looks great! And simple too!